We provide a complete package of Inspection, Maintenance, Recharge, Testing and Repair for all types of Fire Extinguishers. The First Line of Defense. Contact us and get your free quote today! Once a fire has started, things can get crazy very quickly. Your house or business premises are on fire, and you are trying to save a few valuables. You aren’t even sure where to start and where to end to contain and extinguish the fire. What if there was a helper, a partner whom you can turn to when it comes to fires? SteadFast is a special hazard fire suppression service provider that is dedicated to ensuring that fires don’t consume much of your property. All you need is to contact us when you need help when it comes to fire-related issues. Fire extinguishers are crucial when it comes stopping fires before they spread. It can make all the difference in regard to saving your property from fire. We offer portable fire extinguisher services intended to be the first line of defense to cope with fires. Apart from the portable fire extinguishers, we offer fire hose services for fires that can’t be extinguished using the small portable fire extinguishers. Our hoses and extinguishers last long. Therefore, you don’t have to purchase a new fire extinguisher every year. Besides, we offer recharge services intended to keep your fire fighting tools 100% efficient. To ensure that these tools and equipment work as expected, we usually offer annual inspection services. Our highly experienced and trained team will analyze the equipment to ensure that it functions as expected. For homeowners who wish their fire extinguishers and hoses to be inspected monthly, we are ready to ensure that all your fire extinguisher needs are addressed. Besides, SteadFast offers hydrostatic testing, repair and certification services. All these services are offered by our highly trained and qualified team of fire fighters, and therefore, you will never regret our services. Our services are usually thorough and performed using very strict procedures. With that, you can be assured of maximum value for your money. One of the primary reasons you may want to work with us is because we offer training to our clients. Once we supply you with our stuff, we usually train you on how to use the equipment, how to take care of it and its aspects. If you own an organization, we will train your employees about the types of fires and extinguishers and how they should respond to fire outbreaks. They will be aware of the importance of the fire extinguisher and fire hose as fire fighting tools. SteadFast offers a 24-hour service, and we are ready to maintain various facilities. All our prospective and existing clients should know that our team is licensed by the relevant authorities. Besides, the team is trained to handle various kinds of fires. We understand that fire can’t wait, and whenever you contact us about the fire whether you are just consulting or need our physical help, we will act as fast as possible to ensure that your issue is addressed in time. This guide explains what fire extinguishers must be replaced and why. We distribute all types of fire extinguishers, fire hoses, mounting brackets, protective covers and accessories. Why these extinguishers MUST be replaced. Fire extinguishers and fire hoses are hand-operated firefighting equipment used during emergencies to put out or control a fire. Having these items can help to protect you and your property in the event of a fire accident at home. Before you rush to buy a fire extinguisher, understand that they come in different types. They also need to be placed strategically in an area that will be in close reach should there be a need to control fire. Investing in a safety device in your commercial space is one thing but knowing where to place it is another. The good thing with fire extinguishers is that modern versions are very small and occupy less space. The presence of a fire extinguisher at your shop or office space is an indication that safety measures have been put in place to protect people and property in the event of fire. Fire extinguishers are designed to make operation quick and effective. They normally come with a pin that needs to be pulled out for the extinguisher to work. One can simply put out a fire with a press of a button. Fire extinguishers and fire hoses also do not require any kind of maintenance. These safety devices are designed to last for many years without the need for regular upkeep. The only thing you will have to do is make sure the safety equipment has undergone the necessary inspection. Checking fire extinguishers and fire hoses once in every two years will ensure they don’t fail you when you need them most. If you expect the fire extinguisher to help you put out a small fire before the fire brigade arrives, you must ensure that you got the right safety equipment. 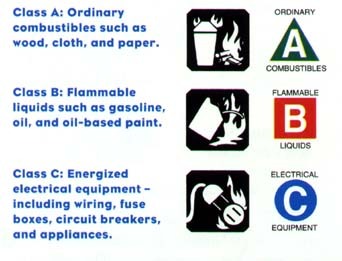 If it’s a household fire extinguisher, it’s likely to be classified as A, B or C. These letters indicate the type of fire that the extinguisher is used on. Some fire extinguishers are designed to be used to put out electrical fires whereas others are designed for flammable liquids among others. One of the things you’ll have to decide on when choosing a fire extinguisher is the size. Bigger fire extinguishers may offer better performance but are sometimes too hard to maneuver because of the weight. Some extinguishers are rechargeable which means that you can refill them when the contents have been depleted after use or due to time. We have many years of experience in dealing with fires. We have helped numerous clients contain fires and even trained them on how to handle fire situations.